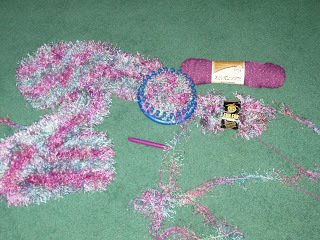 In the winter my daughter started a scarf using the smallest of the circular 'Nifty Knitter' looms. She is using one strand of Fun Fur Prints by Lion Brand Yarn and one strand of Heirloom Sport Weight by Mary Maxim. I noted that it had been sitting untouched for ages so I picked it up the other day and started in on it. It works up very quickly and I find it quite relaxing to do while watching TV. At present I am on the 4th ball of the Fun Fur and the scarf is over 5 feet long. Still have a 5th ball, though don't know if we'll use that. As you can see in the second picture, I have finished the birdhouse blocks. Each one measures 3 inches finished. The pattern showed all the houses of the same fabric, though I found that a bit boring, so I used bits left over from the blocks and from my stash. Much more interesting in my opinion. I haven't decided which block to work on next. I am still working on the embroidery and holly berries for the 'Cardinal' block. I have to admit that I am finding it hard to sew these days. I have stacks of books that are calling to me and I really do want to bury myself in them for hours at a time. I am having to contend myself with listening to "The Three Musketeers" by Alexandre Dumas.. Being a fencer, I am loving the book, specially the duals. I would get in heck from my coach if I ran someone through with my sword, but here I can enjoy it vicariously. I am also reading "Musicophilia" by Oliver Sacks. Am in the final chapters. It is an excellent book as it delves into all sorts of musical phenomena. such as those earworms (when you have a song that keeps running through your head). Should have a review for you within the next week. Of course, I love you birdhouse blocks. Nice assortment of fabrics. 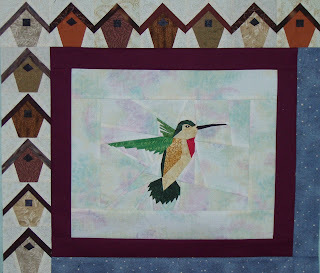 I can't wait to see a final picture of the whole quilt. I'm sure it's going to be fabulous.